Ladies and Gentlemen, my boyfriend, Leonard Cohen. I am about to go to a Ticketmaster location near me and pick up my Leonard Cohen tickets! His concert was the best concert of my life, so we are making the trek to Louisville Kentucky this weekend to go see him again! I am very excited. This time I might even buy a t-shirt! I mean, it will be the most cherished t-shirt in the history of ever and last time I did not buy one. I still kick myself at my own cheapskate ways on that night. Indulging should be over very special things, right? So send me your congratulations, send me your applause, send me Paypal... I am going to see Leonard Cohen! We are going to be staying right at the 4th street area, so if you have downtown Louisville dining tips throw them at me. 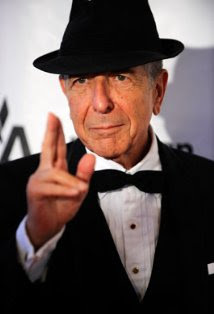 I have no idea who Leonard Cohen is (sorry! I'll Google him), but we recently took a trip to Louisville for the Urban Bourbon Trail. I don't know if you've been to Louisville before, but I'll tell you what I know (which is very little). You'll be right between The Brown (known for the Kentucky Hot Brown, which I think is good and my husband thinks is disgusting) and the Seelbach (the classic Seelbach cocktail is great). I know they both have good restuarants, though we never got to eat at either. We did eat at some places outside of downtown, however, and I would highly recommend Bourbons Bistro (on Frankfort Ave.) or Limestone (a little further out East on Forest Green Blvd.). They're a short drive, but there's also good stuff nearby. Also near you on 4th street is the Maker's Mark restuarant (in the 4th St. Experience, not bad) and a random chocolate place called Arteatables (they have all kinds of bourbon truffles - hey, it was a bourbon-themed vacation for us, so that's pretty much all I know). We stayed at The Brown and walked to all of these (except Bourbons Bistro and Limestone), so you're in a good location. Enjoy your Louisville trip and concert!